Women’s History Month is almost halfway over, but we continue to celebrate with abandon. It’s a time to celebrate contemporary, living, kickass women. The photo series “Change Makers” does just that. Inspired by the spirit of the Women’s March on Washington, these portraits by Jena Cumbo, accompanied by written profiles, feature 33 women leaders of different backgrounds, races, sexualities, ages, and statuses. They’re activists, creators, and standouts in male-dominated fields. 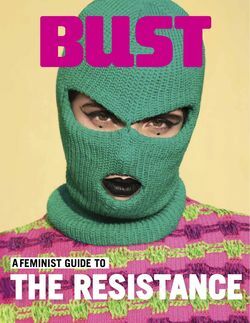 Two of the women featured are Jessamyn Stanley and Lauren Duca, who we've covered in BUST before. Mary Dove produced the project and Camile Sardina conducted the interviews and served as the writer. Lauren Duca is a columnist at Teen Vogue and a freelance journalist. She tackles real-world issues through the lens of pop-culture in a way that has won her awards. Duca went freelance so she could write more of those longer form, thought-provoking pieces that we loved to read. Jessamyn Stanley is a yoga instructor and a body positivity activist. She was an outsider growing up in North Carolina. Stanley discovered yoga during a dark time in her life and it opened up her spirituality in ways she couldn’t imagine before. Now, she teaches it and is an advocate for self-love. In her interview with Change Makers, she talks about authenticity and self-acceptance. She doesn’t care what people think about her. Other women featured include actor Roberta Colindrez; Generation Citizen executive director DeNora Getachew; CNN correspondent Brynn Gringras; New York Civil Liberties Union executive director Donna Lieberman; and Ladygunn founder Koko Ntuen. Here are a few more faces seen in this phenomenal project. Ambra Melendez is an ironworker with Union Local 36. "Change happens when women come around. I might possibly be helping. The presence of women in the industry requires everybody to do the right thing." Caroline Shadood created the podcast Broadist, directs radio promotion for Mute, and DJ's. "I want to see people of color, women, queer and trans folks, fat people, disabled people, and FFS people singing in languages other than English. I want this to be normalized. Skinny, white folks remain the most successful in the industry — we’re trying to change the culture. If I have a women of color or a queer artist, I definitely feel more motivated to amplify those voices, and I know I’m not alone in this." Billie-Grace Ward is vice president of security at Two Sigma Investments, LP. "It isn't important to me that I be included in the trans community. If anything, I would love to be able to walk through the world and not have that title, and nobody really seems to care who I am. I just am a woman to them. That's amazing to me! But, as a demographic minority facing discrimination and persecution, we do need some collective action to thrive, and this is where we come together despite whatever other differences we might have." Deena M. Burjorjee is a financial inclusion specialist. "I tell my kids this all the time; there’s always work. If you’re smart, if you can communicate well — communication is key — if you’re able to express your thoughts, work with a range of different people, and you’re a good writer; there’s always work." Donna Lieberman is the executive director of the New York Civil Liberties Union. "I try to be visionary. I try to be inclusive and respectful. I think that the key to our success, as a movement, is to have values and strong commitment to them, but to find common ground with people we don’t agree with on everything. I think that’s the key to our ability to resist the current political regime and it’s the key to our ability to make positive change for the most vulnerable and for the rights of everybody." Jennifer Li created Map&Move. "Travel is a medium to take you out of your routine. Ironically, I feel most empowered and in control of my life, when I do the most wild and unpredictable of things. It gives me a sense of owning the unknown, which ultimately makes me feel fearless. That feeling permeates to other areas of my life; like taking a chance on a side hustle or starting a new career." Judaline Cassidy is a union plumber and the executive director of Tools and Tiaras. "Being a black woman, I can’t be half-assed like the other guys. I know wherever I walk in this world, I am black. I give 100% all the time. When you do that and they give you flack, rest assured your work is the silencer to the naysayers. Your work ethic is your strength. Every job I ever worked, nobody follows me. They know it’s done because I always give 100%." Roberta Colindrez is an actor and writer. "I think we can allow ourselves to not be pretty all the time. I think we’re allowed to be ugly. I think we have such pressure to always be held accountable for the actions of others. We can be monsters and terrible, I’m not saying those people are role models, but they’re real. We’re allowed to explore those dark sides of ourselves. If you’re going to be a monster, you might as well be out in the open about it." Activist, author, and broadcaster Yassmin Abdel-Magied works in STEM. "I thought I could be ‘one of the boys’, I thought that would be my way of surviving and thriving. What I didn’t realize was that I would never really be ‘one of the boys.' I shouldn’t have to be. A truly inclusive environment wouldn’t ask me to change who I am to fit in. When I realized that - after a penny dropping conversation with a colleague - I began to assert myself differently. I suppose I just became a lot less apologetic for who I was." You can read the full interviews and lots more on the Change Makers website.